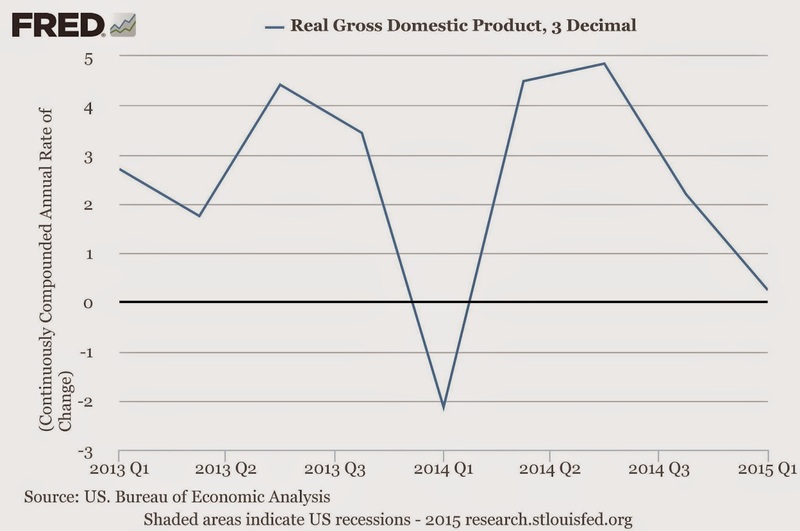 In the Washington Post last week, Larry Summers wrote about some new research finding evidence of "hysteresis." This is a term borrowed from the natural sciences for when temporary occurrences have lasting effects - e.g., when you hold a magnet up to a piece of metal, the metal remains magnetized even after you remove the magnet. 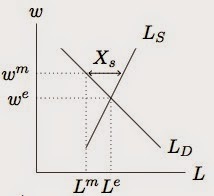 In macroeconomics, hysteresis occurs when an economic downturn has a lasting effect on economic capacity (i.e., reduced "potential output"); that is, lack of demand creates its own lack of supply. Hysteresis could occur through a number of channels. Consider an economy described by an aggregate production function Y* = AF(K,N*) where potential GDP (Y*) depends on productivity (A), capital (K) and labor at its "natural" or "full-employment" level, N*. A recession occurs when output falls below Y* and labor is below N* (i.e., there is unemployment in excess of the "natural rate"). Hysteresis implies that there is a lasting impact on Y* - this could occur through technology, capital or labor. All three channels could be operative. In the past several years, productivity growth has been sluggish, though its not clear if this is linked with the recession (productivity trends are always somewhat mysterious). 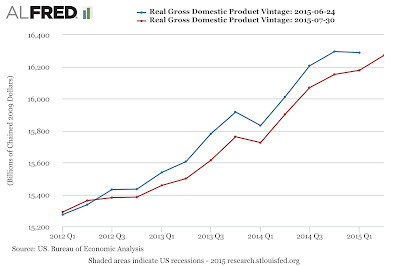 The recovery of investment (the rate of flow into the stock of capital) from the recession has been less than spectacular, even taking out housing - the share of GDP devoted to nonresidential fixed investment is somewhat below its peak in previous expansions. Here, I want to focus on labor, where the hysteresis effects are pretty evident, and raise an interesting policy dilemma. Although the unemployment rate has fallen to what we might consider a reasonably healthy level of 5% (the normal turnover of a healthy labor market generates some unemployment so we never expect it to get to zero), the labor market still clearly bears the scars of the 2008-09 recession. 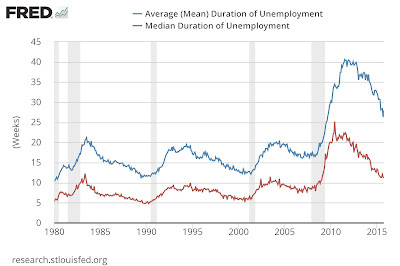 The duration of unemployment spells rose to unprecedented levels and has remained elevated (a useful comparison is to the 1981-82 recession - the unemployment rate peaked at 10.8% at the end of 1982, but the dynamics of duration were not nearly as severe). People with spells of long-term unemployment have a harder time finding jobs. But looking at the unemployed leaves out those who left the labor force entirely. The last several years have seen a significant drop in labor force participation rates, even among people aged 25-54 (focusing on this group is a rough way to control for the drop in overall participation due to an aging population, though as this Calculated Risk post notes, there is a composition effect even within the 'prime age' group). The labor market clearly is not as robust as the headline unemployment rate suggests. [I]f we think of the long-term unemployed as being subject to the mismatch problem and highly likely to leave the labor force, then these unemployed workers are not contributing much to labor market slack. They are unlikely to be hired under any conditions. That is, the unemployment (and presumably the depressed particpation rate, too) is "structural" in nature, and not amenable to any improvement in aggregate demand that might be generated with expansionary monetary policy. 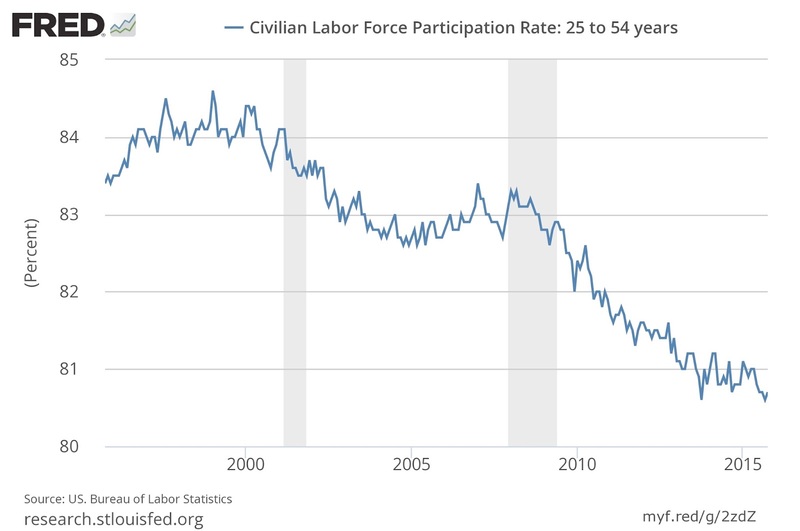 An alternative view is that the long-term unemployed, and some of those who have exited the labor force, could be brought back into employment by particularly strong aggregate demand - what used to be called a "high pressure" economy. This would be possible if the forces of hysteresis work in both directions, as this 1999 paper by Laurence Ball suggested. 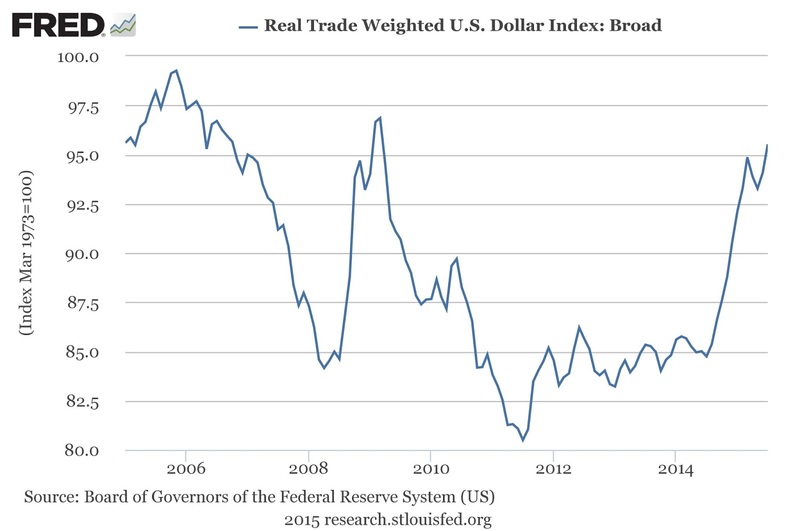 It seems to be that doing this would likely entail the Fed overshooting its 2% inflation target. I have my doubts about their willingness to do this (and Yellen certainly did not suggest it). And for it to work, inflation expectations would need to remain anchored (i.e., if any additional inflation just ratched up expectations, it would not bring unemployment down). Among the steps the Fed has taken to increase transparency in recent years is the release of projections by the board members and regional bank presidents. This includes the "dot plot" indicating each participant's belief about what the appropriate federal funds rate target will be at the end of this year and the next three years. 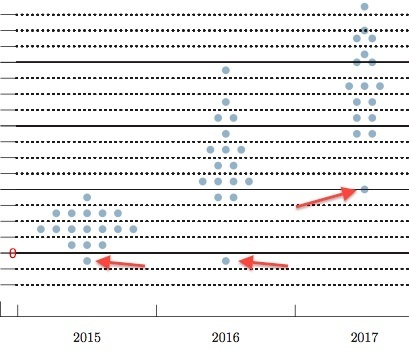 One of the dots from the latest release (I've indicated with a red arrow) shows a preference for a negative fed funds rate this year and next, and a much lower rate than everyone else expects at the end of 2017. Of more serious interest, the projections also included a reduction in the median "longer run" federal funds target, to 3.5%, from 3.8% at the last release in June, and also a lower estimate of the "longer run" unemployment rate, which might be taken as a proxy for a NAIRU estimate (see Krugman). Economics is not the kind of science in which there could ever be one true model that works best in all contexts. The point is not “to reach a consensus about which model is right,” as Romer puts it, but to figure out which model applies best in a given setting. And doing that will always remain a craft, not a science, especially when the choice has to be made in real time. The social world differs from the physical world because it is man-made and hence almost infinitely malleable. So, unlike the natural sciences, economics advances scientifically not by replacing old models with better ones, but by expanding its library of models, with each shedding light on a different social contingency. Or, as Keynes put it, "Economics is the science of thinking in terms of models joined to the art of choosing models which are relevant to the contemporary world." Rodrik goes on to discuss Borges' story "On Exactitude in Science" - a parable about cartographers who make a map on the same scale as the world it was meant to represent. This story, which was our reading for Econ 110 yesterday, illustrates the point that "more realistic" isn't necessarily better. From the Depression to the Vietnam War to the Iraq war to the euro crisis, we surely should learn that policymakers who elevate credibility over responding to clear realities make grave errors. The best way the Fed can maintain and enhance its credibility is to support a fully employed American economy achieving its inflation target with stable financial conditions. The greatest damage it could do to its credibility would be to embrace central-banking shibboleth disconnected from current economic reality. The inflation problems of the 1970s, the loss of Fed credibility that came with it, and the need to impose the Volcker recession in the early 1980s to bring inflation down to tolerable levels made an indelible impression on policymakers who lived through that time period. The Fed’s trigger-happy response to any suggestion of an inflation problem is directly related to the desire to never let such an inflation outburst happen again. But it has been more than four decades since the beginning of the inflation problems of the 1970s, and the economic environment in which monetary policy operates has changed considerably since that time. Those changes support patience, particularly in response to increases in wages, wages that have been stagnant since the 1970s even as labor productivity has been increasing. The "credibility" argument in monetary policy is based on the idea that the central bank will be tempted to use inflation to "overheat" the economy and bring unemployment down below its "natural" (or equilibrium) levels for political reasons - e.g., to help the incumbent party in an election year. Any gains would be, at best, short-lived, as people would incorporate a higher level of inflation into their expectations and set wages and prices accordingly. Based on this logic - which seems helpful for interpreting how we got into the "stagflation" of the 1970s - economists look for policies and institutional structures to correct this perceived inflationary bias. The red line is drawn at 2%. Measures of expected inflation are also below 2%. 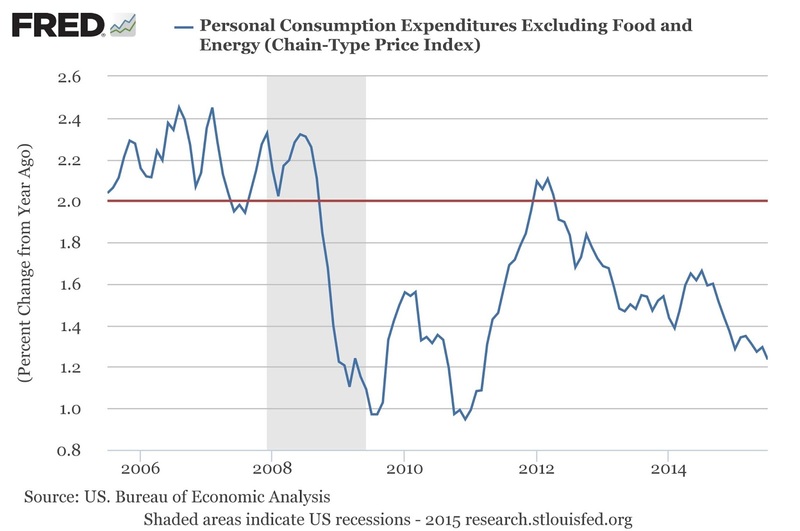 David Beckworth recently argued that the Fed is acting as if 2% is a ceiling, not a target - he suggests the Fed's behavior is consistent with it aiming to keep inflation between 1% and 2%. 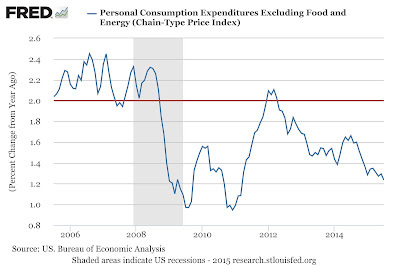 But the the Fed declared in 2012: "The Committee judges that inflation at the rate of 2 percent, as measured by the annual change in the price index for personal consumption expenditures, is most consistent over the longer run with the Federal Reserve's statutory mandate." If the goal is to "anchor" expectations at 2%, the Fed is at risk of failing, but the greater threat to its credibility seems to be too little inflation, not too much. 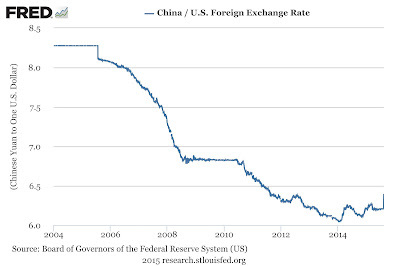 Last month, just before China let its currency deprecate and its stock market crashed, the San Francisco Fed published a nice Economic Letter by Zheng Liu, "Is China's Growth Miracle Over?" China's rapid, but decelerating, growth is broadly consistent with the implications of the classic Solow growth model we teach our intermediate macroeconomics students. This model predicts that low-income countries should grow quickly, but growth will slow down as they approach the leading countries, whose per-capita growth is constrained by the rate of technological progress. 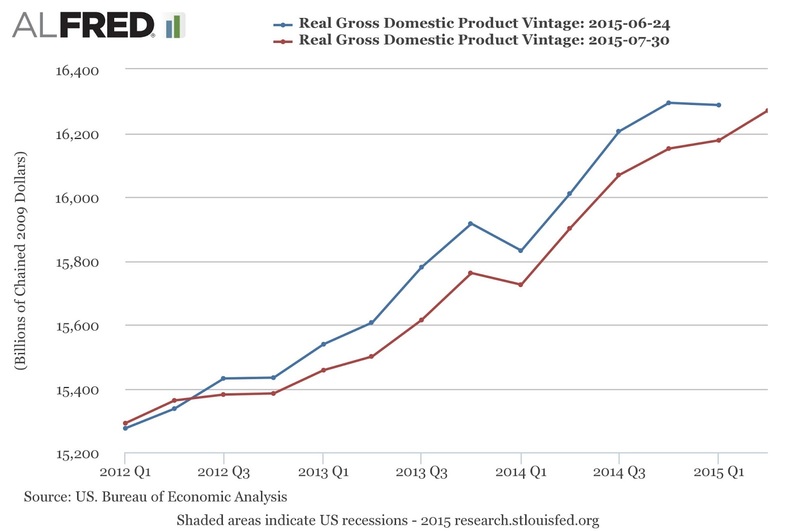 That is, there should be "convergence" in per capita GDP. As this chart from the letter shows, China is following a similar path to Korea and Japan. where the slope is the marginal product of capital (MPk). The idea can be extended to include "human capital" (i.e., knowledge and skills), as Mankiw, Romer and Weil did in a 1992 paper. (1) A diminishing marginal product of capital implies that the financial rewards to investing in a low income country should be vastly higher than in high-income countries. In a world where people can invest across borders, this implies a huge incentives for financial flows from high-income to low-income countries, but we do not observe such large net flows. This was the puzzle Robert Lucas noted in a 1990 paper. (2) While the experiences of some low-income countries is consistent with the convergence hypothesis; in many cases, low-income countries have fallen further behind (or, as Lant Pritchett wrote, "Divergence, Big Time."). From the standpoint of the Solow model, growth "miracles" like those of Korea are to be expected, and the real puzzle is the fact the failure of so many countries to converge. 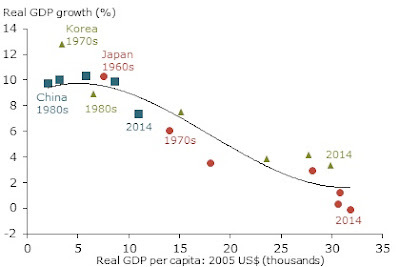 As Moses Abramovitz pointed out in 1986, it is usually a subset of the low-income countries that are growing fastest. This would suggest there are forces for convergence, but something is preventing them from applying everywhere. Current thinking is that the answer lies in "institutions" - the set of legal rights, culture, and governance which shape the economic environment and incentives for people to take actions within it, including to accumulate capital. This is where assuming that China will continue to follow in the convergence footsteps of Korea and Japan may be questionable. 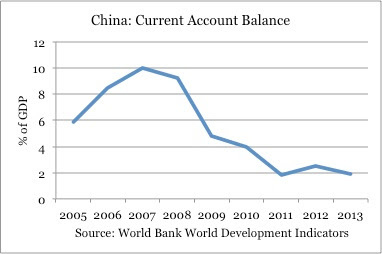 While China's institutions have gotten it this far, there are reasons to doubt whether they are appropriate for achieving levels of GDP per capita comparable to Korea, Japan and Europe, as this column by Brad DeLong and this by Eduardo Porter discuss. That said, the institutions in the US during its late 19th century industrialization were hardly what an economist would recommend (in particular, corruption was rampant), and yet it somehow managed to take over leadership in per capita GDP from Britain. Economists often use the word "technology" to mean the relationship between output and factors of production such as capital and labor. 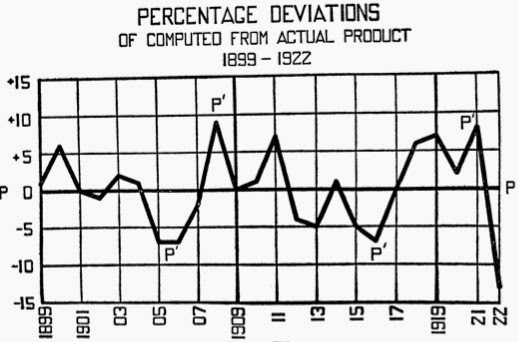 The Cobb-Douglas production function, which is a ubiquitous description of technology has its origin in a 1928 AER article, "A Theory of Production," by Charles Cobb and Paul Douglas. Although the description of technology is a theoretical contribution, much of the article is empirical in nature, as they construct indexes of capital and labor in order to test their model. 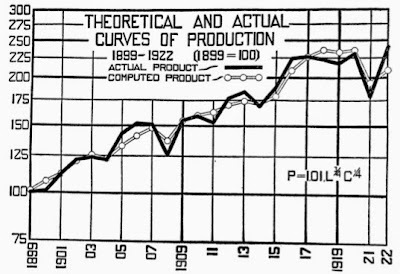 They compare the production implied by their function and estimates of capital and labor, P', with a measure of actual production. To a contemporary macroeconomist reader, the striking thing about the article is the extent to which it anticipates how we analyze business cycles today. 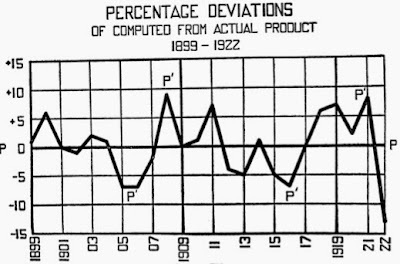 Cobb and Douglas, separate out cyclical and trend components (using 3 year moving averages) and show that the deviations of actual production and the production implied by changes in capital and labor are procyclical. 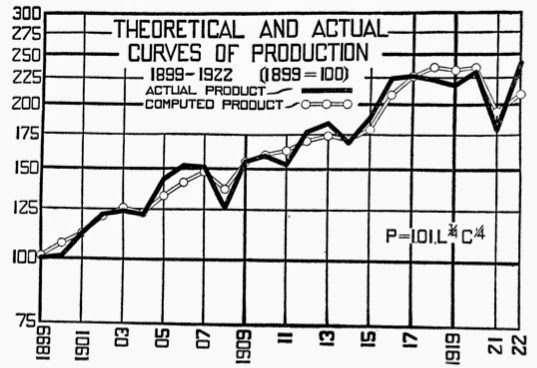 Cobb and Douglas' estimates are annual, but several of these do line up with points where P' (implied production) exceeds actual production, P.
The index does not of course measure the short-time fluctuations in the amount of capital used. Thus, no allowance is made for the capital which is allowed to be idle during periods of business depression nor for the greater than normal intensity of use int he form of second shifts etc., which characterizes the periods of prospertity. At the time, many called for immediately restructuring privately held debt, thus imposing losses on the banks and investors who had lent money to Greece. Among them were several members of the IMF’s board and Karl Otto Pohl, a former president of the Bundesbank and a key architect of the euro. The IMF and European authorities responded that restructuring would cause global financial mayhem. As Pohl candidly noted, that was merely a cover for bailing out German and French banks, which had been among the largest enablers of Greek profligacy. Ultimately, the authorities' approach merely replaced one problem with another: IMF and official European loans were used to repay private creditors. Thus, despite a belated restructuring in 2012, Greece's obligations remain unbearable -- only now they are owed almost entirely to official creditors. This complicates the politics: the citizenry of Europe feels that Greece has already gotten a rescue at their expense, and now any restructuring is a hit to government finances (including to those of the US, as the largest shareholder of the IMF). But since the debt has been transferred from the private to the official sector, it is tempting to believe that a Greek default - and an exit from the euro - are less likely to spark a financial crisis (though I wouldn't be so sure about this; people thought markets were "prepared" for Lehman's bankruptcy after all...). The Greek government's handling of the situation has been less than smooth - I'm not sure what to make of the complaints about their negotiating style, but raising old war reparations claims and playing footsie with Putin do not seem like constructive steps. Still, the fundamental position articulated by Greek finance minister Varoufakis in this Project Syndicate piece seems very reasonable (much more so than that of the EU finance ministers sniping at him). The shape of a deal is therefore clear: basically, a standstill on further austerity, with Greece agreeing to make significant but not ever-growing payments to its creditors. Such a deal would set the stage for economic recovery, perhaps slow at the start, but finally offering some hope. What the European partners want is much less clear. They would love to get paid back on all the current Greek government debt that they hold but that's unlikely to happen. 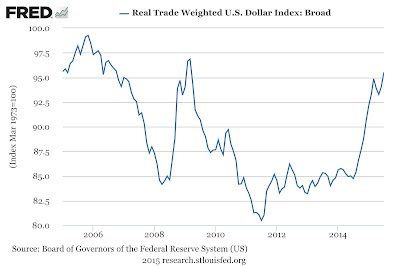 Some would love to see Greece outside of the Euro area so that they do not have to deal with this again. There is a sense that whatever agreement is found now will not be the last one. The lack of trust has reached levels that has made it clear to some that Grexit is the best long-term outcome. But they are afraid of the consequences, both in the short run and in the long run in terms of credibility of the membership that would be left after Greece was gone. This will be a test of the wisdom and statesmanship of Europe's leaders; Roger Cohen reminds us why - despite how lousy it looks at the moment - the European project is worth saving. Things look set down to go down to the wire: the Greek government is scrounging all the euros out of its couch cushions but at some point it will miss a payment, which will force some difficult decisions. Here's hoping Angela Merkel, Mario Draghi et al. rise to the occasion. Update (5/5): The FT's Gideon Rachman makes a case for Grexit. One of the claims about the Trans-Pacific Partnership (TPP) agreement is that it will benefit developing countries. At Vox, Dylan Matthews spoke with Kimberly Ann Elliot of the Center for Global Development about how it will affect Vietnam, which has the lowest income among the countries negotiating the treaty. Trade diversion: part of the perceived benefit for Vietnam would be that its exports would get more favorable treatment than those of other developing countries, like Cambodia, that are not members of the TPP. This is not necessarily a gain in terms of overall economic efficiency. Preference erosion: once countries in an agreement have preferential treatment for their exports, they may resist multilateral reductions in trade barriers with bigger global benefits (i.e., agreements through the WTO), because that would reduce their advantage relative to nonmembers. Rules of origin: in an age of multinational production chains, defining whether a good exported from a particular country is eligible for preferential treatment is less than straightforward. Rules of origin (ROOs) are meant to prevent trans-shipment, e.g., bringing Chinese goods to the US through Vietnam, but doing so creates a great deal of complexity in these agreements as questions like how should a shirt made in Vietnam of Indian cloth be treated need to be hammered out. Overall, this is a further reminder that assessing the economics of these agreements is much more complex than simply applying our findings about the gains from trade.